Organized at Connersville, Ind., and mustered in at Indianapolis, Ind., August 24, 1861. Moved to St. Louis, Mo., September. Attached to Fremont's Army of the West and Dept. of the Missouri to February, 1862. Jefferson City, Mo., Dept. of Missouri, to March, 1862. Central District of Missouri, Dept. of Missouri, to February, 1863. District of Southwest Missouri, Dept. of Missouri, to June, 1863. District of Rolla, Mo. ; Department of Missouri, to July, 1863. District of St. Louis, Mo., Department of Missouri, to January, 1864. Artillery, 3rd Division, 16th Army Corps, Army of the Tennessee, to December, 1864. 2nd Brigade, 2nd Division, Detachment Army of the Tennessee, Dept. of the Cumberland, to February, 1865. Artillery, 1st Division, 16th Army Corps (New), Military Division West Mississippi, to August, 1865. 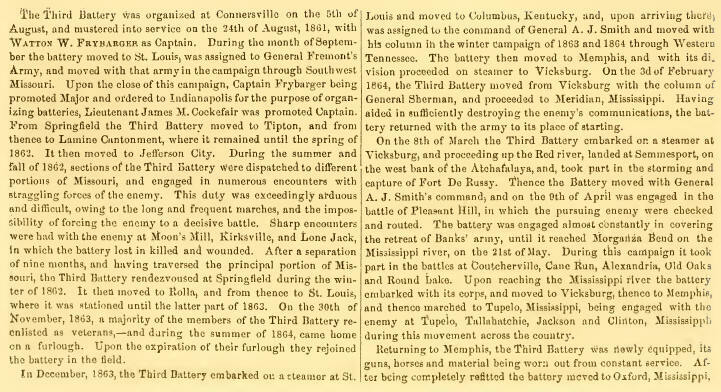 SERVICE.--Fremont's advance on Springfield, Mo., September 23-November 2, 1861. Duty at Tipton and LaMine, Mo., until February, 1862. Duty at Jefferson City, Mo., until November, 1862. Expedition in Moniteau County and Skirmish March 25-28. Campaign against Porter's and Poindexter's guerrillas July 20-September 10. Actions at Moore's Mills July 28; Kirkesville August 6; near Stockton August 9; Lone Jack August 16. Duty at Springfield, Rolla and St. Louis, Mo., November, 1862, to. December, 1863. Reenlisted November 30, 1863. Moved to Columbus, Ky. Smith's Campaign in Western Tennessee against Forest December 20-26. Moved to Vicksburg, Miss., January 23, 1864. Meridian Campaign February 3-March 2. Red River Campaign March 10-May 22. Fort DeRussy March 14. Occupation of Alexandria April 16. Battle of Pleasant Hill April 9. About Cloutiersville April 22-24. Cotile Landing April 25. Red River May 3-7. Retreat to Morganza May 13-20. Mansura May 16. Yellow Bayou May 18. Moved to Vicksburg May 19-24, thence to Memphis, Tenn., May 25-June 10. Old River Lake or Lake Chicot June 6. Smith's Expedition to Tupelo, Miss., July 5-21. Harrisburg, near Tupelo, July 14-15. Old Town (or Tishamingo Creek) July 15. Smith's Expedition to Oxford, Miss., August 1-30. Moved to Jefferson Barracks, Mo., September 8-19. Expedition to Do Soto September 20-October 1. March through Missouri in pursuit of Price October 2-November 19. Moved to Nashville, Tenn., November 25-December 1. Battle of Nashville December 15-16. Pursuit of Hood to the Tennessee River December 17-28. Moved to Eastport, Miss., and duty there until February, 1865. Expedition from Eastport to Iuka January 9, 1865. Moved to New Orleans, La., February 7-22. Campaign against Mobile and its defenses March 17-April 12. Siege of Spanish Fort and Fort Blakely March 26-April 8. Fort Blakely April 9. Capture of Mobile April 12. March to Montgomery April 13-25. Duty at Montgomery and Selma till July 30. Ordered home July 30, and mustered out at Indianapolis, Ind., August 21, 1865.